One table remaining, one decision to be made as play on the opening day of action, Tuesday 6th March, in the Men’s Singles event in the qualification tournament for the Seamaster 2018 ITTF World Tour Platinum Qatar Open in Doha came to a close, it was a dramatic ending. Sweden’s Mattias Karlsson beat China’s Liu Dingshuo by the very narrowest of seven games margins to keep his aspirations of a place in the main draw very much alive. Earlier in the day, Liu Dingshuo had beaten Frenchman, Can Akkuzu in four straight games (11-6, 13-11, 12-10, 11-4); success against Mattias Karlsson would secure top spot in the group. It was not to be the scenario but he came mighty close. Leading three games to two, in the sixth game he led 6-3, in the deciding seventh, he was ahead 10-9; he was not able to make the most of the advantage but make no mistake, great credit must go to Mattias Karlsson who proceeded to win the next three points. 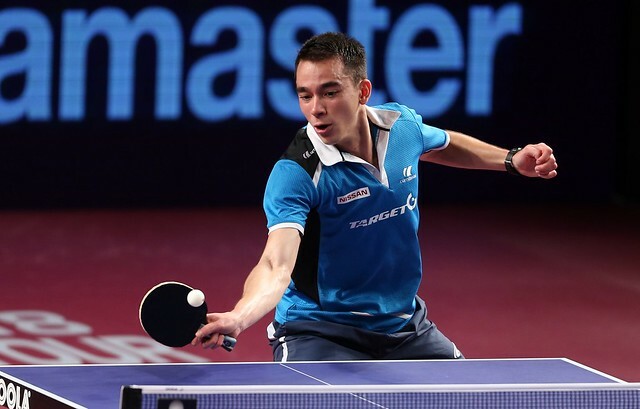 He saved the match point by staying close to the table, Liu Dingshuo maintained a tirade of top spin strokes but he was a step back; Mattias Karlsson controlled the point. Speak to any player in the world and they will tell you that when confronting an adversary from China, become involved in rallies and they are the clear favourites. In that department, at the crucial stages, Mattias Karlsson more than matched Liu Dingshuo, the 2015 World Junior champion. Furthermore, it was to some extent a welcome return to action for the Swede; he had been forced to withdraw from the recent 2018 ITTF Team World Cup owing to an ankle injury. “It was the left ankle but now all is fine, otherwise I would not be here. Certainly it was a disappointment to miss the Team World Cup. Today I felt good, losing 9-10 in the seventh, throughout the rally I had the advantage; eventually, he played wide to the forehand, he missed. I felt good, I felt strong but believe me it was really tough; it was so hard to close out the match. It’s the second time I’ve beaten a Chinese player on the ITTF World Tour. Three years ago I beat Yan An in Poland.” Mattias Karlsson. The win somewhat atoned for an earlier disappointment in the afternoon when Kristian Karlsson, listed at no.17 on the current Men’s World Ranking, was beaten by a young man who is a very special talent. He lost to Chinese Taipei’s 16 year old Lin Yun-Ju, named at no.108 on the current order of merit (11-5, 11-5, 11-7, 4-11, 5-11, 13-11).